Me and my husband smiling with our braces on. Braces, Extractions, Jackets, Retainers, Crowns, Monthly Cleaning, Teeth Whitening and the like. All of these might sound simple enough but to some people, they are considered frightening. A dentist's job is never easy and sometimes no matter how hard they try to be nice and gentle to their patients, they just end up not going back for their next appointments which of course disappoints them. I admit that I used to be one of them. But why did I fear going to the dentist? Thinking about it now, I guess the only reason I can come up with is the fact that they have scary looking tools and that the idea of sitting in a dental chair seems like you are sitting in a torture device while the dentist continues to probe your mouth. I am sure this all sounds silly especially to adults but some people might have thought the same way I did. However, some people fear dentists because of their past experiences with some bad ones. Example: having the wrong tooth extracted or the anaesthesia administered to you did not take much effect yet and then a procedure gets started on you. Traumatic experiences like that make people generalize so even if they should not fear all dentists, they end up doing so. Because of my fear of dentists, I have been scared of going to dental appointments. What's worse, my aunt is a dentist and she is our family dentist. I remember her telling me an embarassing story about me when I was young. That was my first tooth extraction. My parents had it done at home as I did not want to go to the clinic to have it done. My aunt said that I kept on shouting, crying and calling every single saint I knew. I was literally asking for help. I had to be held by my parents in order forthe extraction to finish and I kept on crying until I fell asleep. Through the years, that experience haunted me and even if I was already told early on, during my high school years, that I should get braces, I did not. I dodged every single attempt which led me to getting them later in life. I am turning 30 this year and I have had my braces for almost 2 years now. I don't know how it happened. It was all still a blur. Somehow I was able to just endure and persevere through all the pain of having it done and the continuous pain that comes with every single adjustment that goes with it. I remember that when I first got it, it was hard for me to eat everything I wanted. I had to abstain from eating crunchy, hard and sticky food. Chips were a big no-no. Gummy candies were not allowed either. Even crunchy pig or chicken skin as well as popcorn. I thought I would go mad at first but look at me now. 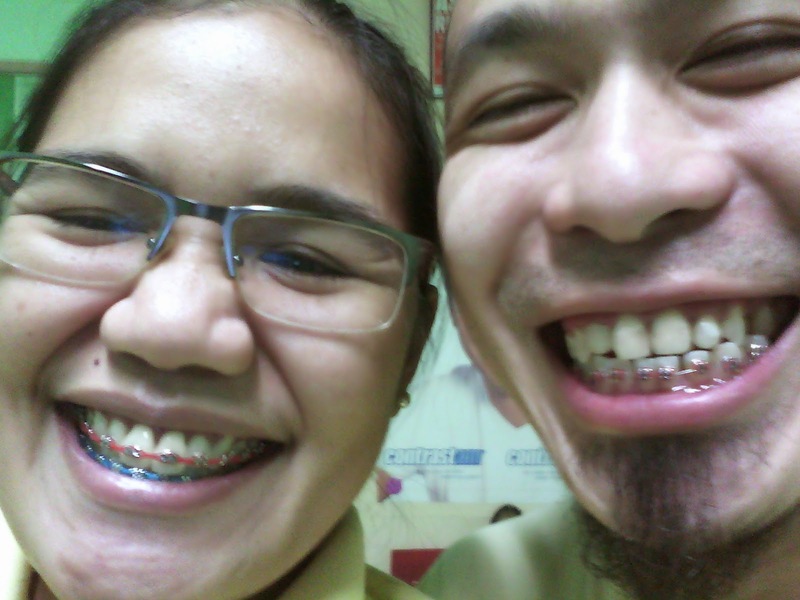 Unlike me who has had these braces for some time now, my husbnd just got his last night and he has been complaining already. Now, he keeps on apologizing to me as he realized how hard it must have been for me. I should be happy with payback but I guess I can't. I know what he is going through and will be going through. Luckily for me, I was told that I will be having mine removed by next year but oddly enough, I refused. Why? I am not really sure. Maybe I am scared that with it gone, my teeth won't be in their fixed state any longer. I can adapt to the change, I just wanted to be assured that there won't be any gaps in between my teeth afterward. Whether it is separation anxiety issues or I am just being a masochist, I just hope that everything will pay off soon. I know my husband still has a long way to go but I know he will be able to cope with the changes. If I can give advices to other people who are considering getting braces, I will tell them the truth. The truth braces are like torture devices. They continue to pain you, the longer it is in you. You will suffer in more ways than one. Each person with braces will have his/her own share of misfortunes because of it. You will grow to hate it, be disgusted by it but in the end, it will all be worth it. For me, I see it now as a journey, a roller coaster ride if you will. No matter how many awkward, painful, embarassing or hilarious moments happen to you because of them, they will end and I think that by refusing to have mine removed early next year is testament to the fact that once you get used to the discomfort of having one, you will just find it have to separate ways. Call me crazy if you will but I am sure I am not the only person that this happened to. Dentists are not the same scary monsters that most children see them as. They are merely doctors of our teeth. I guess as an adult, I can now say that no matter how filthy and how gross it is to have their hands on other people's mouths to get to their teeth, they will still do their jobs as dentists which is something that most people often neglect to see. I may still be in slight pain right due to my newly adjusted braces but I cannot bring myself to imagine what my teeth woud have been now if not for them. Thankfully, I still have my aunt to help me get these despite all the misgivings I have done to her and all the other dentists out there. Now, I can say that there's more to life than being afraid of a dentist and what he/she can do.